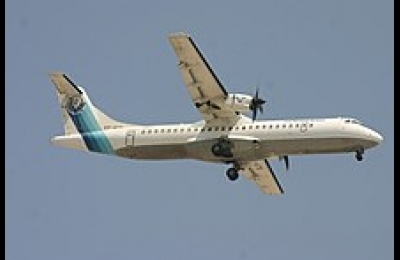 Yesterday, the Iranian military announced the wreckage of an Aseman Airlines airplane, which went missing on Sunday morning shortly before it was due to land in Yasuj, had been located at an elevation of about 13,000&#160;feet (4,000&#160;m) in the Zagros Mountains. All 65 people on board were presumed dead. Crews were searching for the aircraft's two black boxes to try to determine why it crashed. Ramezan Sharif, a spokesman for Iran's Revolutionary Guards, said wreckage of the ATR 72-500 twin-engine turboprop had been sighted by a military drone and helicopters had then been sent to the location. Helicopter pilot Captain Soheili said on state television the wreckage was only some 100&#160;feet (30&#160;m) from a peak on Mount Dena, and "large parts of the plane, which were labeled with the Aseman company logo" were visible. The Revolutionary Guards released photos in which they said bodies of victims could be seen. Regional medical center director Ghafoor Rastinrooz told the official IRNA news agency that helicopters were unable to land at the site because of "deep and dangerous crevices in the area of the crash". General Kiumars Heidari, chief of ground forces in the Iranian Army, told the Fars News Agency the dead would have to be brought down the mountain by commandos using specialized ground vehicles. The plane took off at about 0430&#160;UTC on Sunday from the Iranian capital, Tehran, on Aseman Airlines route EP3704 to Yasuj, in the southwest of the country. It vanished from controllers' radar screens at about 8:52&#160;local time, 0522&#160;UTC, and there were reports from people in the area of Samirom, about 14&#160;miles (22&#160;km) from its destination in Isfahan Province, of seeing it attempting an emergency landing in a pasture and of hearing the crash. Hundreds of searchers organized by the Red Crescent and using drones and dogs combed the mountainous terrain but were hampered by windy, foggy conditions and heavy snow. The search had to be suspended on Sunday. It resumed at dawn on Monday but weather then forced grounding the helicopters. At one point on Monday local officials announced searchers had found the wreckage, only to have the national civil aviation agency and the Red Crescent indicate the statement had been premature. A demonstration was reported by more than 100&#160;people outside a Dena Kooh government office, demanding resignations. The plane reportedly had a crew of six — a pilot and a co-pilot, two flight attendants, and two security guards — and 59 passengers, one of them a child. A man who recounted missing the flight told the Tabnak news site "God has been really kind to me", expressing his sadness over those who had died. The aircraft was 24 years old. Aseman Airlines, Iran's third largest air carrier and owned by the national civil service pension foundation, said it had been in storage for seven years before recently being placed in operation again. Iran's aircraft are aging and the country has been prevented from buying spare parts by international sanctions imposed in response to its nuclear program. Those sanctions were to be lifted under an agreement from 2015, and Iranian airlines, including Aseman, have ordered new planes from both Airbus and Boeing. However, since becoming US President, Donald Trump has declined to recertify the agreement.